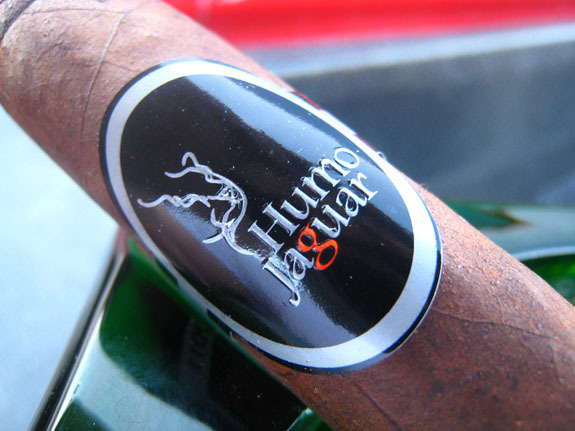 Today, I have decided to check out the Humo Jaguar 2011. All the manufacturers who attend the annual Honduran Cigar Festival blend a cigar specific for the festival and one cigar is chosen as the best. Nestor Plasencia claimed this title in 2011. This cigar is readily available through online retailers. 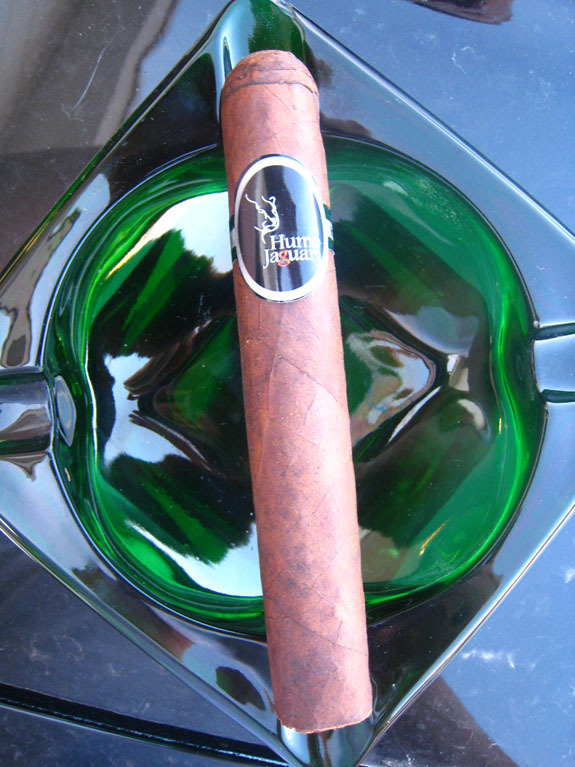 The Humo Jaguar 2011 comes in three vitolas: Robusto (5 by 52), Corona Gorda (6 by 52), and Gigante or Grande (6 by 60). While not a go to size for me, I will be smoking the Gigante 6 by 60. The Humu Jaguar has a rustic appeal. Veins are all over the cigar but there are none above medium in size. 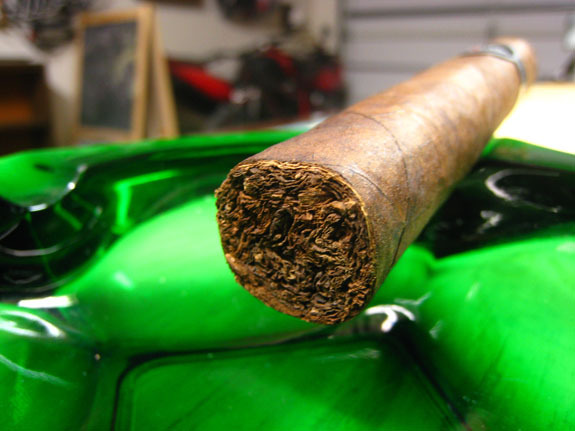 The cigar has a velvety feel and is fairly firm with no soft spots. However, under the band there is a crazy indention in this cigar. The color is mostly medium reddish brown with dark spots throughout. The wrapper aroma is extremely earthy with some nutty and sweet notes. The nuttiness is similar to the shell of a peanut. 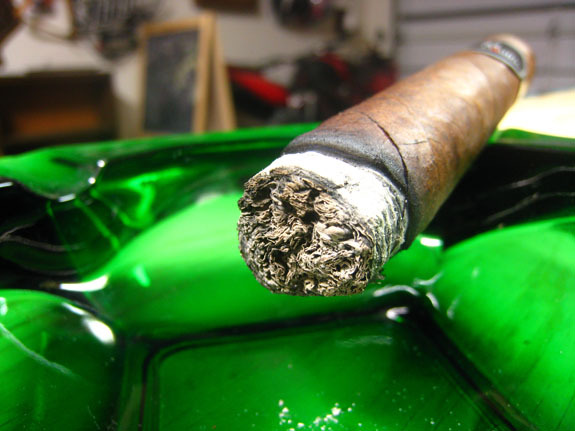 A minor pepper and tobacco notes are prevalent on the foot of the cigar. What appears to be a triple cap has been applied rather sloppy. 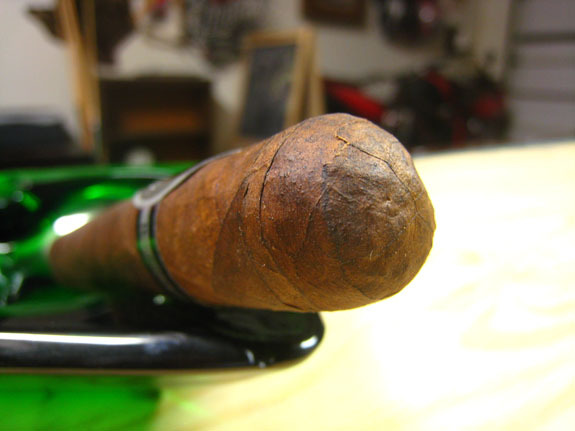 Due to the larger ring gauge, I made a shallow cut on the cap of the cigar. A free draw delivers rich tobacco and clove flavors. The 60 ring gauge foot took some time to light with my Zippo Z-Plus!. A triple flame would have come in handy when lighting up this puppy. Instantly, smooth and spicy smoke coats my mouth. The leather and earth flavors dominates the profile but not in a bad way. In the background of the flavor profile some mineral-like flavors are peeking through, along with a sweet finish. The leather flavor is something I anticipated knowing the Honduran origin. Deep earthy notes and dark coffee comes forth on the retrohale, with additional spice and pepper. The first salt and pepper ash dropped at a half of an inch, but the second ash held to an inch. The smoke production is decent but a long draw is required to pull the smoke down this six inch stick. The Humo burn line is thick and wavy but isn’t getting too off path. Flavors are coming through medium/full and the strength is medium. The flavors remain heavy and deep as I dive into the second third. Some enjoyable cocoa and coffee flavors have arrived and the earthy notes remain around. The smoke production is now rockin. Tons of thick, dense smoke is billowing out of this Humo Jaguar Gingante. The black pepper on the retrohale is intense. Some sweetness is still on the finish but quickly fades to a deep earth, almost dirt-like, flavor. I thought for sure I would be feeling some strength in the cigar by this point. So far so good. While the strength is medium the cigar is still very flavorful. The burn-line has almost completely corrected itself from the waviness early on. The band slides off with ease, giving way to the final third of the winner of the 2011 Honduran Cigar Festival. A similar spice from the start of first third is back, warming my entire mouth. I have not come across any harshness in the smoke thus far and the smoke remain cools. A cocoa sweetness hits the front of the palate, but darker, earth flavors override it. The dark flavors are heavy on my palate requiring a lot of water to keep a fresh palate between puffs. The smoke is very meaty. A mixture of earth, pepper, and saltiness reminds me of McCormick’s Montreal Steak Seasoning. 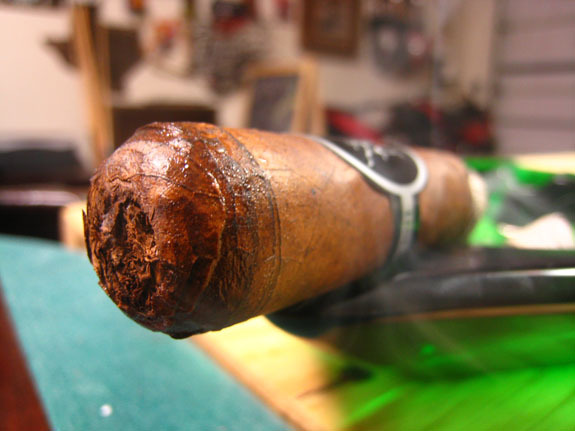 The burn-line is now razor sharp and not one touch-up was needed throughout this six inch Humo Jaguar. The flavors are full at the conclusion of the final third and strength has shifted to the medium/full arena. The Humo Jaguar 2011 was super earthy. Probably one of the most earthy cigars I have smoked or at least remember smoking. But overall it was a very enjoyable stick. There were some subtle complexities but the fullness of the earth flavor overwhelmed the other enjoyable, more subtle notes. While I may not go out of my way to search down this stick, I would grab a single if I ever came across it or if it was included in another sampler like the one above. If you enjoy earthy cigars, this cigar will be right up your alley. Shoot, 12 cigars for $19.99 is a heck of steal and the offer is still available here. 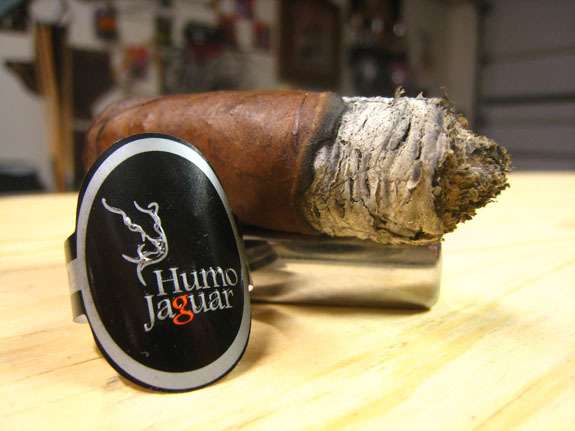 Grab the sampler and let us know what you think of the Humo Jaguar 2011. Nice write up Jeremy. Tony sent me one of these about a year and a half ago, and I can honestly say that it was the first 60rg that I’ve enjoyed. I don’t recall getting as much earthiness as you did, but it had a lot of cocoa/coffee to it and took about 2-1/2 hours to smoke. I haven’t had one since, but I do have a robusto sitting that I will get to soon. Interesting story on the stick, since RP also claims to have won the award, and both cigars were made by Plasencia. That’s a heck of a deal. I might have to get in on it.